Marseille-Longchamp super site, a joint effort of AirPACA (Regional Air Quality Network) and LCE, is located in the IMERA (Institute for advanced studies of the Aix Marseille University) facilities nearby the Longchamp park, downtown Marseille. Classified as an urban background environment, the measurements carried out in Marseille-5 avenues are representative of the air pollution breathed by Marseille's inhabitants. 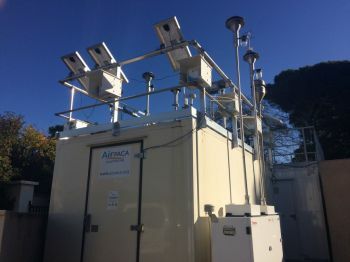 The super site gathers a complete set of unregulated pollutants measurements allowing a better understanding of particles pollution phenomenology (physico-chemical properties, sources) in a complex Mediterranean urban environment and, in the medium term, to refine the health impact of atmospheric particles. Marseille-5 avenues super site is a state of the art scientific platform as well as an information and evaluation tool of the effectiveness of public policies. Its goal is also to host ambitious national and international research projects as wel as training schools for Master and PhD students.